Struggling with the likes and comments? Sick with the follow-for-follow game? Seeing a decline in instagram followers? Then this post is for you! Here I share my tried and tested instagram hacks. Instagram is the social media channel of choice of many influencers. It’s a channel best suited to visual content and perfect for engaging with new audiences. However, like most digital platforms, it changes constantly. And as an influencer you have to continue to adapt and improve your digital skills in order to master the various techniques to engage your audience. Instagram Pods. Real Or Fake Engagement? This is a bit of a controversial topic. One of the other techniques I’ve also tried is instagram comment pods, and even now I still participate in a few. Whilst the engagement isn’t always perfect, you can be sure that the person leaving a comment/like is a real account. But there is still some “fakeness” about it. Seeing as the engagement is actually prompted, you could argue that this is not true engagement and actually fake. However I have found some great new accounts through the instagram pods I’ve been in and have continued to follow and like/comment on those accounts I really relate to. And vice versa, I myself continue to see engagement from some of those that I have met through instagram pods. The pods only work if everyone in them is fair and honest. This includes leaving relevant comments and catching up when required to do so. So if you are looking to boost your engagement a little bit, then finding a good instagram pod might be right for you. Most bloggers, myself included, have a love/hate relationship with instagram. We love it, because we know it’s an ideal channel for sharing visual and creative content to audiences. But then we hate it due to the decline in engagement and limited ways for us to optimise content. But the first step to improving your instagram is to fall in love with it again. You need to be passionate about the content you are creating so that you are continually striving to improve it and make it as best as it can be. If you don’t, then how do you expect it to do well? So how did I fall in love with instagram again? Firstly, forget about likes and follows. Secondly focus on content that makes you happy. Focus on creating beautiful content you are proud of then the rest will fall into place. Inspired by minimalist fashion feeds, I became obsessed with creating similar feeds and began over-planning my content. From using a specific filter, to ensuring that every other picture was of the same theme. I was so stressed when I didn’t have a photo to post that “fit” within the aesthetic I aspired to achieve. What started out as being inspired by other influencers, led to me doubting my own creativity. Leading me nicely to my next point. Delete any accounts that make you feel bad about yourself. I cannot stress this enough. It’s not only good for your mental health, but it will prevent stifling your creativity. Of course you should follow accounts that either inspire your or that you inspire to be like. But you should never compare yourself to others or simply copy others. 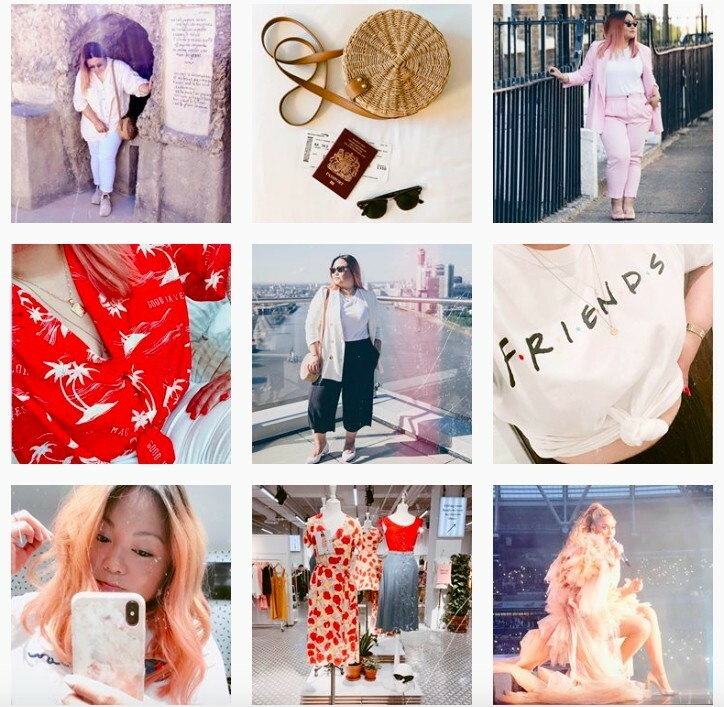 As tempting as it might be to try and recreate similar outfit shots or flatlays as your favourite influencer, you should stay true to yourself and create content that makes you happy. This way you can carve a niche for yourself and grow a following that will appreciate your content for what it is. They say a picture speaks a thousand words. Well what do yours say? One of the biggest factors of getting more people to your profile page is to make them click through, and this is usually when your able to engage them with an interesting caption. So make sure yours tells a story that will want them to click through. Think about it, you click to ‘like’ an image if you like the look of it. But you will click through their profile if their caption engages you. This will lead to more follows if people like the overall look of your profile and feed. I also found that stories are a great way to get engagement. One of my highest performing insta stories was one I tagged for a certain location. I usually get between 40-80 views of a single story. But this particular one had almost 300! Which was unheard of for my stories. But I found that the views came in from people watching the story via the location tag. So make sure you make use of this feature and use stories more. The great thing about stories is that there is also less pressure to keep it within a certain ‘theme’ or ‘aesthetic’ as they only appear for 24 hours unless you keep them on your profile. This is probably the biggest factor in how I get my own engagement. Actually engaging with accounts and giving likes and comments has led me to get engagement on my own profile. I also found that I get more follows when engaging with new accounts. I usually start with the popular page, and go through and like and comment on pics I genuinely like. I find that these accounts will tend to either engage back or just follow me. Which is great as I know they are not in it for the follow-for-follow game and also like my content. Another technique to try is to go through the comments of profiles you follow. Then engage with these accounts and you will often find that they engage with you back. These are people that often turn into loyal followers if you continue to produce content that they like and can relate to. This is why it’s good to engage with those that follow accounts you follow, as you will probably have similar likes. Are you an influencer trying to crack the instagram game? Have your own tips to share? Let me know in the comments below. I fall in and out of love with Instagram quite regularly, but I find I get a lot more out of it when I interact more. I’m loving these hacks! I recently re-branded my Instagram and I’ve completely fell back in love with it. Will keep your tips in mind. Great tips! Instagram is hard going and as much as I love it, I dont love the behind the scenes tricks! I love taking photos though and I try to focus on my enjoyment over my engagement! I’ll definitely be taking these tips on board. Instagram can be such a tough platform to crack so I am going to utilise these. Thank you. I really don’t enjoy Instagram any more, it feels like such a chore! Instagram is something I am just dabbling in at the moment so thanks for the tips. Instagram is getting difficult but I still love it. Because there I can share some of my fav content. And true about a story telling through description. It always works for me.